Photos via 3 Sons Brewing Drink Features 3 Sons Brewing Co.
It’s a Friday morning in Chicago as I arrive at the Goose Island Barrel House. My group, which consists of six individuals with their livers prepped for a weekend in Munster, Indiana, file into the facility eager to learn about the country’s largest barrel program. Only one of us, however, is taking notes as we tour the 143,000-square-foot warehouse. Quietly observing, Corey Artanis, founder of 3 Sons Brewing Company, eyes the seemingly endless aisles of barrels that could represent the possibilities ahead. With a calm and humble demeanor, you would never know this individual is the same Corey Artanis who won best beer and brewery at Cigar City’s Huna Day the last two years. Corey’s talent and dedication to his craft exceeds the expectations set forth by those awards. And he hasn’t even opened a taproom yet. 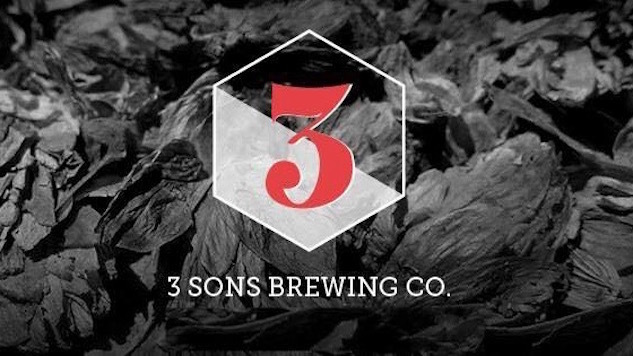 To say the craft beer community is eager for 3 Sons to open its doors is an understatement. With that date finally within reach, I spoke with Corey about the journey that got him to where he is and what the future holds for 3 Sons. Paste: What beers or breweries first influenced you to get into craft beer? Corey Artanis: After I graduated High School in ‘98, I joined the army and was stationed in Fort Lewis, Washington. Here is where I first truly experienced craft beer drinking beers like Fat Tire, Pyramid Hefeweizen, and Alaskan Amber. These three really opened the door to craft for me. Paste: Would you say these beers are what lead you into homebrewing? CA: Well I actually had my first homebrew while I was in the army as well. A buddy of mine’s father actually brewed beer and we made a road trip out to his hometown in Idaho. The whole idea that I was drinking a homebrew was just crazy to me, because at that point I didn’t realize you could actually brew beer at home. He lived in a little skiing village; it was very scenic, there were elk walking down the road, the food was amazing, the beer was great. It was just overall such a cool experience. After that, I knew I wanted to try brewing beer. Paste: You have mentioned that you started homebrewing on a kit in 2006. At what moment did you know you wanted to become a brewer? Then the next time I did a bottle share, I brought my own beer again, and people were going crazy, so I decided “why don’t I try to pour some of my beers at a festival and see what happens?” So I made my way down to St. Petersburg, to this little Brewpub called “The Brewers Tasting Room” that my father actually told me about. The Brewpub allows people that are aspiring to become brewers brew on their one barrel steam brew house. Hearing that was really the first time I thought I could actually brew for a profession. So I went on to do Huna day and other events, and continued to get great feedback and it just kept building more and more momentum, and that made me realize that brewing was what I wanted to do. At first I thought I wanted to work for a brewery, I never thought before then that I could actually open my own brewery. Paste: So what made you decide you wanted to open your own brewery rather than join an existing one? CA: I realized that the whole craft beer scene in Florida really hadn’t taken off, especially when I started; there were barely any craft breweries, so I thought, I could probably open up my own. Since the beginning, my father has always been a big supporter. When I started I had a full time job, and kids, so I brewed on my days off, which was like a part time job. My father always helped me out so I could afford to do events and pour my beers at different places. He really enjoyed my beer and eventually at one point we realized we could start a business and open a brewery, so we both decided, “let’s do it.” In 2013 we went into brewery mode, planning and what not. We started doing the research, looking for property, going on educational trips like the Craft Brewers Conference for the first time, and really ramping up to do what we needed to do open a brewery. Paste: About a year ago you began working at the Brass Tap. What can you tell us about how that relationship started? CA: In February 2015 I started working at the Brass Tap in Naples, Florida. Prior to that, I used to go around to different restaurants with my beers and let them try it for upcoming events. My brother lived near the Brass Tap and he spoke with the owners and told them that they needed to try my beer. So eventually, I met up with them and they liked my beers, so I began to do events such as Oktoberfest there. About a month later, they contacted me and said that they knew I was trying to open a brewery and that they were looking to put a small brew house in two of their new locations and wanted to know if I could brew for them. They told me that I could still continue to look to open my own place, and have the freedom to do what I want and really build out my beer portfolio, and of course I was like “sure.” It was pretty much a no brainer for me. So I began driving out to Naples four days a week, and then September of 2015, they opened their second location in Ft. Lauderdale, so I then started to go to Naples less. I have someone that brews under me there, and I make the trip out there now once a week and then do the rest of my week here in Ft. Lauderdale. Paste: So in 2015 you win “Best Beer” and “Best Brewery” at Cigar City’s Huna Day. How surprised were you when you found out? CA: I first poured my beers in 2014, and I think that year I made a pretty big name for myself, coming out of nowhere. People were just shocked how good the beers were I was pouring, and that just built up momentum for the following year. The second year (2015) was the first time they had voting for best brewery and best beer, and that completely caught me by surprise because I completely forgot they were even doing any type of judging. When I found out that I had won, I was in shock. They always have a ton of really good breweries that are pouring at Huna Day, so to me it was like winning the beer Olympics. Then this past year (2016) I was even more shocked because I won first and second for Best Beer, and first for Best Brewery, and that was next to breweries like Side Project, Toppling Goliath, Lost Abbey…it was the best of the best. It was unbelievable. Paste: How has the reception been since Huna? CA: It’s been pretty crazy. We usually get an email or phone call once a week asking what’s going on with the tasting room, where it is, or whatever. The reception has been overwhelmingly good. I did my first collaboration with Cycle Brewing recently, which was called Rare Scooop (Neapolitan stout), which turned out really well. I really love that treatment to the beer, it works amazing, so I was glad we were able to do that. I just brewed a collaboration beer with Abnormal Beer Company in San Diego. The roasters I usually get my coffee from, Mostra Coffee are in San Diego, and they do coffee for a number of breweries and are big in Cali. I have used their coffee for a number of my beers, including the Kopi Summation that was poured at Huna in 2015, my Jamaican Blue Mountain stout (JBM 35), and Apple Brandy Kona Summation that I poured this year. Mostra asked me if I could come out to San Diego to brew with Abnormal for their Three Year Anniversary. So that is coming up, and then there are a few brewers from Huna that I have been speaking to about doing a collaboration with in the future. One will be Bottle Logic, which I am flying out to brew with next month. Paste: Beers such as Summation, Lumberjack Morning Break, and JBM35 have gained a lot of popularity in the craft beer community. Can you tell us about your inspiration behind these big beers? CA: I am really into coffee, and one of the first vanilla stouts I ever had was Goose Island’s 2010 Vanilla Bourbon County. I just remember that beer completely blew my mind, just how amazing it was. I was like, “I’ve never had a vanilla and coffee beer,” so that was the inspiration behind Summation. For Lumberjack, the inspiration was Kentucky Brunch Brand Stout form Toppling Goliath. I actually had it my first time at Huna Day. The guys from Toppling Goliath brought down some bottles and that beer completely blew me away, and I was like “damn, I love this beer,” so that’s my version. For JBM35 there wasn’t really any beer that inspired it; it was just something I really wanted to try. The combination of coconut, coffee, and chocolate just sounded amazing to me. I also brewed a regular version called 35 which didn’t have the Jamaica blue coffee. It’s called 35 because I brewed it to celebrate my 35th birthday. Paste: Is 2016 the year we see 3 Sons finally open? CA: Right now we are looking at opening in the next eight to 10 months, most likely in the first quarter of 2017 in Dania Beach, Florida. I believe it’s the oldest city in Brower County. Right now they are really trying to revitalize the city. Condos are going up left and right, plus they just finished renovating the Dania Beach Jai Alai & Casino, so it’s definitely an up and coming area. Location wise, it’s right between Boca and Miami so it will be easy for most people to get to. Paste: What can you tell us about your current barrel aging program, and how that will change once you have a new brewing space? CA: We are definitely going to be doing a lot of barrel aging at the Brewery. We are going to do a members club, so there will be bottles that will be allocated for members only. Right now we’re thinking six barrel-aged beers for members, as well as some additional barrel-aged beers for public releases. We are going to start small. We plan to brew 10 barrel batches, so not a whole lot. It might increase a little bit, but it all depends on the quality. I don’t want to lose quality with quantity so we will look to find our sweet spot. Paste: If you could do a collaboration beer with any brewery, who would it be, and what beer would you brew? CA: That’s a tough one, but I would have to choose Cantillon or Drie Fonteinen just because I am so intrigued by their brewing and blending process and what they can do with beer. It would just be an amazing learning experience to be a part of that. To brew something with them would be unbelievable; I don’t think many people get the opportunity to do that. The whole process they have is just amazing and very interesting to me. Obviously I would want to brew a Lambic with them. Paste: What is your favorite beer to drink other than your own? CA: I don’t really have one; I get a lot of different beers from friends, so I am usually drinking something that is unique to my area. If I had to choose one, it would probably be something from Sierra Nevada. They are making awesome stuff that’s inexpensive and I can drink a lot of. Paste: If you could change one thing about craft beer today, what would it be? CA: It probably would be the trolling and some of the stuff people get into with beer trading. It’s getting a little out of hand. I don’t trade anymore, but it seems like a lot of people these days just try to win trades, whereas before it was about the whole experience of getting new beers from different places. I’m not sure how to change it back, but a lot of it is because of the whole secondary market, where people are selling the beer at exorbitant prices which I think is messed up. I think the whole thing is affecting people’s mentality because now when people try to get beer, they only see dollar signs. Other than that though, I think the craft beer scene is pretty awesome right now. There is a sense of comradery and brotherhood between breweries and that’s been great to experience.